0008767: setCameraTarget(x,y,z) has incorrect calculation. this script should make camera's position of player be no change. because the function has just changing only position of camera's lookat with fixed position of camera. but the script makes position of camera. (also lookat position). Is it not expected result? That function only changes the rotation based on the player into the direction (position). You should use setCameraMatrix for your desired effect. Necktrox // i want to make rebound of gun system(up crosshair when shot). So i should know detaily about setCameraTarget. but wiki has no detail explain. where is the explain about "the rotation based on the player"? And what is the based position? wiki just says "The target position that you want the local camera to look at". can you help me make the rebound system? setCameraTarget will only change the angles to the player. The angle that function calculates is incorrect. can you test it to know my problem? 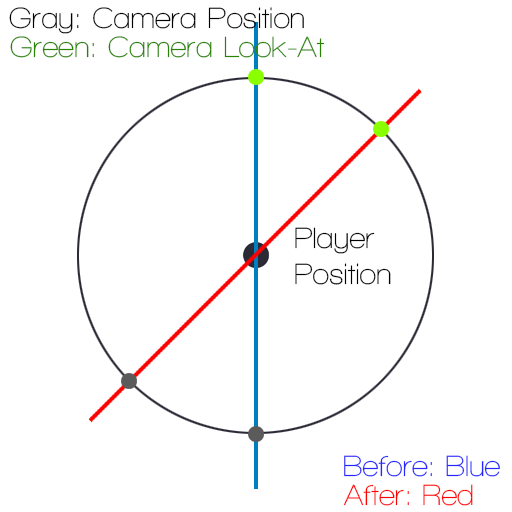 when camera is higher or lower, calculated camera's lookat position go to middle. there is no problem about left, right. but up, down result is incorrect. mta team, please test it. Then, how should i do to calculate correct vertical angle? The problem was that setCameraTarget was based on the player position instead of the camera position before. This did not significantly influence the calculated angles when focusing a specific point, but caused the camera to look backwards when using the lookAt vector.